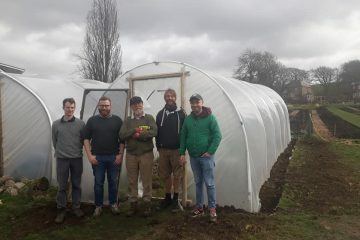 Last year we were lucky enough to get funding from Tesco Bags of Help to develop the growing space and sensory garden. 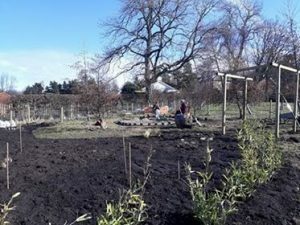 So thanks to everyone who put a green token in the box for us because it has helped us develop this lovely area at the top of the site which will eventually be our quiet thinking space. 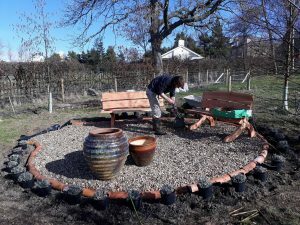 The gorgeous larch benches were made by local craftsman Oran Villiers-Stuart and the pots are from a local pottery Errington- Reay. 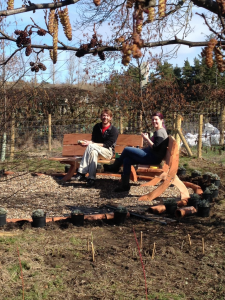 We have planted lots of shrubs and trees, lavender, a bamboo screen and honeysuckle at the entry archway and put bird feeders around the benches. Soon we will have those gorgeous pots filled with beautiful flowers. Thank you Tesco!